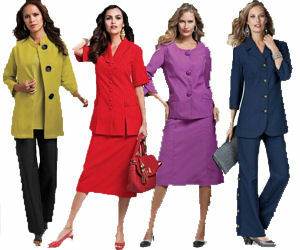 A career woman needs professional clothing and for a woman with curves that means plus size business clothing. The concrete jungle can be a difficult place to navigate, and women with full figures have often had a more difficult time than others particularly when it comes to finding suitable fashions for the office or board room. There's this odd concept in the fashion industry that anyone wearing more than a size 8 is a "plus size" - really? Thankfully, however, in the last few years more and more manufacturers have realized that real women have real curves and have begun making clothing for the plus size market that doesn't look like a gunny sack. Looking specifically to business attire, even the growing options still leave challenges. Find well- fitted outfits for your body type can prove frustrating. And sometime plus size clothing is a little more expensive too. That means you have to shop smart and build your boardroom wardrobe a little at a time, choosing specific pieces that mix and match with an appropriate style for your profession. There are some hints that can help you with getting the perfect plus size business clothing. First, in my opinion it's better to buy classic styles than trendy pieces. Good quality professional clothing may have a high price tag, but if you buy the classics you'll have something that will last for years without going out of style. You can always add an accessory that reflects current fashion trends to update the look for any season. Second, while you can find business outfits at department stores, it's much easier to find a variety of options at a store dedicated to the Plus Size customer. Think of it this way: when you want a coat you're more likely to find what you want at a coat outlet right? The same holds true for plus size clothing. Don't be afraid to let your fingers do some online "window shopping" to find out what stores are having good sales on the types of pieces you want at a price you can afford. Third - keep your initial selections simple. Go for basic foundation colors like earth tones, black and grey. These work for every season throughout the year. As with classic designs, classic colors make your wardrobe more flexible. You can always add a splash of color with a scarf, earrings, or shoes (for example). Last and most importantly make sure the plus size business clothing you choose fits you right. Saggy dresses or blouses do nothing for a professional demeanor. You want crisp pants, a-line skirts or dresses that go no higher than your knee and perhaps a tidy jacket. Round that out with sensible shoes and you're going to end up with something that speaks volumes about your attitude.